Using the map provided you are going to map out what Canada looked like three years after Confederation. You'll do this in a group. You need to assemble the map. As accurately as possible, you have to outline the Northwestern Territories, Rupert's Land, Manitoba, Ontario, Quebec, New Brunswick, and Nova Scotia. You should also outline British Columbia, Prince Edward Island, and Newfoundland (and Labrador) but remember that they're not part of Canada so they won't be colored. Neatly color each of these areas in a separate color. You don't need to color each area in fully. It can be done as a series of parallel lines or cross hatchings. It should be neat, and not scribbled. Neatly label each section of the map. 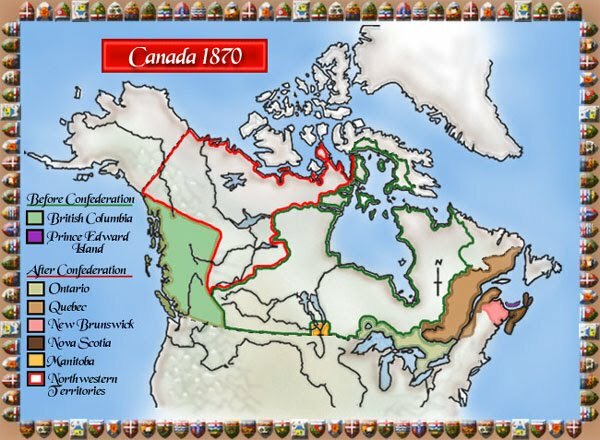 Does the map accurately reflect the boundaries of Canada in 1870? Is the map neatly and accurately colored with a good choice of colors so you can easily tell the different areas apart? Did your group work well together finding a way to include everyone in the work? Canadian boundaries displayed the way they were in 1870. Cooperation Was everybody included who wanted to be?